Walking my usual way toward the local shrine, the terraced rice fields below on the right, the pink-colored slopes on the left - yes, it is time for the PINK with the fringed petals and its fragrant smell. This flower has been introduced to Japan from China and is known for its medical properties too. It comes in white, pink and lilac, altogether more than 300 varieties. It blooms from June to August and is also one of the seven herbs and flowers of Autumn, but as a kigo, it represents the late summer. Its precious little flower with the fringed petals reminds us of a lover or beloved child and since the Heian period the characters 撫子 were used to represent this flower. Literally it means a child (ko 子) so sweet it is stroked (nade 撫). The Chinese Nadeshiko (kara nadeshiko　唐撫子) was also introduced during the Heian period, but nowadays the Japanese Nadashiko (yamato nadeshiko　大和撫子) is more common. 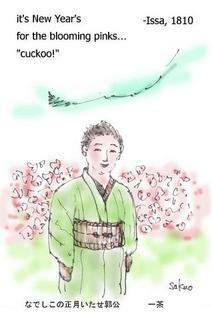 This flower is the subject of many poems in the Manyoo-Shuu　万葉集 "Collection of Ten Thousand Leaves" . It is a symbol of a flower planted in spring, bringing forth its flowers (the fruit of love) in autumn. Some of the older names are tokonatsu (常夏), literally "endless summer" and omohigusa, omoigusa (思草). Let us look at some other Japanese names for this plant. 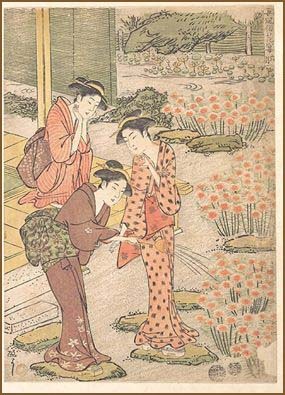 "Three Young Women in a Garden where Nadeshiko Pinks are Growing"
. oiransoo 花魁草 Phlox paniculata . mushitori nadeshiko 虫取撫子 (むしとりなでしこ) "insect catching nadeshiko"
is referred to by Japanese as a woman with attributes that were considered traditionally desirable from the perspective of a male dominated society; generally ascribed to people with traditional upbringings. It is an extremely broad, but complicated Japanese aesthetic concept. 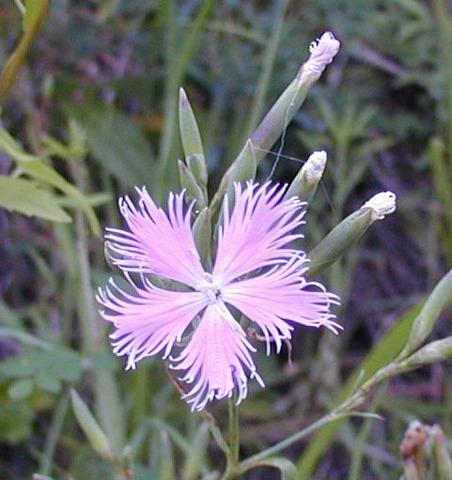 The name is believed to originate from the willowy Dianthus superbus or the Japanese Nadeshiko flower. "A Japanese woman (with all the traditional graces); an ideal Japanese woman." " A figure of speech for the beauty of Japanese women who are neat and tidy." Also known as an ideal Japanese woman, it basically revolves around acting for the benefit of the family and following the instructions or acting in the best interest of patriarchal authority figures. Virtues include: loyalty, domestic ability, wisdom, and humility. During World War II, the idea of Yamato Nadeshiko was popularized as a kind of national propaganda by the Japanese government. A Yamato Nadeshiko should be able to endure all the pain and poverty of life for her husband (a soldier) and the country, and should always be ready to fight with naginata or tae yari and to be ready to die at any time, for her country or to keep her chastity. LOOK at the Courtesan HERE ! 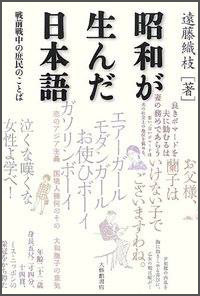 with an essay about the modern metaphorical use of "Yamato nadeshiko" to describe women. There is also a discussion about nadeshiko in the PMJS forum (November 2016). The nadeshiko (nadesikwo) 撫子|瞿麦 was apparently a favorite flower of the poet Otomo no Yakamochi. The “little pink” (Yamato nadeshiko) is the future Tamakazura. 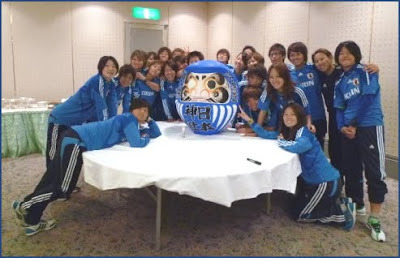 Japan women's national football team . Issa has at least 13 haiku about this flower. Why did the pink break, oh why did it break? KUSU refers to the warrior Kusunoki Masashige 楠正成 (1294 - 1336).
. Kusunoki Masashige 楠木正成 .
. Basho Hokku about Tears .
. shimo no nochi nadeshiko sakeru hioke kana .
. youte nen nadeshiko sakeru ishi no ue . In Sora's poem, Nadeshiko, the pink, is the season word indicating summer. 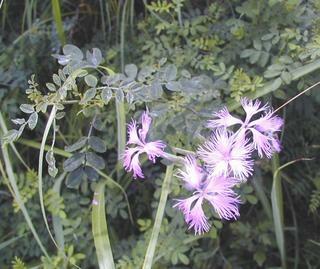 Although this flower is numbered among the seven grasses of autumn, in haikai it is considered to indicate summer. Nadeshiko; we see it used in The Tale of Genji in the "Broom Tree" chapter. Because this name is one of charm and beauty, Sora did not expect to find it in the rustic countryside, and consequently he took it to mean, "layered," a more commonplace word pronounced the same way. is a leitmotif throughout this work in particular and Japanese literature in general. Evidently meeting this little girl named Kasane in such an auspicious way greatly affected Basho for the memory of the encounter stayed with him. He dscribes the meeting in other places besides this diary, and once, when a friend asked him to suggest a name for his newborn daughter, gave Kasane as his recommendation. On another occasion, Basho recalled this episode and told Sora that if he had had a little girl of his own, he would have named her Kasane. It looks like a thousand-handed Kannon Bosatsu. Country of origin is China. It looks very similar to the wild carnation (nadeshiko). It flowers in may and june, usually with white flowers. The petals are thinly lapped with deep cuts. These plants are a bit smaller than the wild carnation, but very tough and live in rough natural environments, especially in high mountain areas. This flower is the most common gift for Mother's Day. Its origin is South Europe and Western Asia. Legend says that when Jesus was killed, his mother Maria cried and her tears fell on the ground, where the carnations would then start to grow. The most common colors are red and white. Click HERE to look at some ! mure nadeshiko 群撫子（むれなでしこ）"crowd of pinks"
Gypsophila elegans. in pink, white etc. Although 'nadeshiko' most often refers to a child, it can also refer to an adult woman. 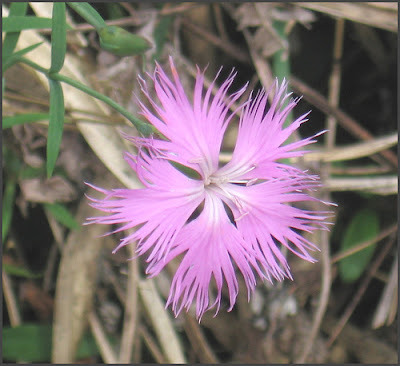 (Dianthus superbus, flower known as the "pink", i.e. a graceful Japanese lady)." "The pink or daisy ('nadeshiko') is a delicate potted plant synbolic of Japanese virtue." Earl Miner translates 'nadeshiko' as "maidenflower" in his translation of Basho's haiku, although there is another flower called maidenflower, 'ominaeshi', so I don't know if Miner's translation is justified.